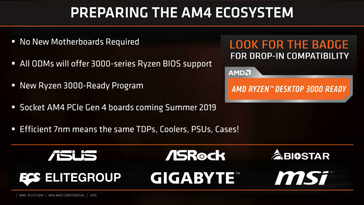 July 7 will see the launch of AMD's 7 nm parts including the Ryzen 3000 CPUs and Navi GPUs alongside the new X570 chipset. A detailed announcement is expected during Computex 2019 in June followed by wide availability in July. AMD is also expected to announce 12 and 16-core Ryzen CPUs in the July to September timeframe. While Zen 2 is mostly on track, the simultaneous launch of Navi depends on whether TSMC is able to cater to the demand. At CES 2019, AMD showed a sneak peak of the upcoming Ryzen 3000 CPU. We've also seen AMD launching the Radeon VII officially on February 7 and looks like AMD might repeat the same for its upcoming 7 nm parts such as the Ryzen 3000 series CPUs (Matisse) and the Navi GPU as well alongside the X570 chispet — only this time, it will be on July 7. 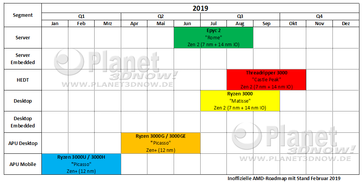 According to information received by RedGamingTech and a roadmap by Planet3DNow, AMD is expected to detail the specifics of its new 7 nm Zen 2 platform at Computex 2019 in June followed by wide availability in July. AMD is likely to set the launch date as July 7 to emphasize the 7 nm fabrication process. We will also be seeing the Epyc 2 'Rome' server CPUs launch a bit earlier June while the Threadripper 3000 'Castle Peak' CPUs will debut in August. It is to be noted that laptops featuring 12 nm Ryzen 3000 APUs have already started shipping. Although AMD showed an 8-core engineering sample at CES 2019, RedGamingTech reports that system integrators / OEMs are also expecting 12-core and 16-core Ryzen 3000 CPUs. This was speculated earlier as well as the CPU showed by Lisa Su at CES seemed asymmetrical in design and there clearly was space for another 7 nm die besides the larger I/O chiplet. OEMs apparently don't have any samples for testing right now but are likely to get some in April. It is possible that the higher core parts will have a deferred launch due to yields and also to possibly to counter Intel's 10 nm 10-core Comet Lake. An unknown product 'Rhino' is also in the offing in late Q2 2019 but details are scarce right now — it could be another CPU, APU, or a mobile product. All current socket AM4 motherboards will offer BIOS updates to ensure compatibility with the new CPUs. OEMs will also be adding drop-in support via the Ryzen 3000-ready program. Of course, we will also be seeing the flagship X570 chipset and motherboards launch alongside the new Ryzen 3000 CPUs. Since the new CPUs will be targeting higher clocks, motherboard OEMs will be looking to build better overclocking features and thereby, more robust VRM implementations. The upcoming B550 chipset is also likely to get some overclocking love. While we know about support for PCI-Express 4.0 in the new chipset, details about improvements to XFR, PBO, and StoreMI will be known closer to launch. The new Radeon VII did have its fair share of day zero driver issues and it still does not completely beat the NVIDIA GeForce RTX 2080 at its game. Nevertheless, AMD seems to be pushing hard to launch Navi, the successor to Vega, in the same July 7 timeframe as Ryzen 3000. The issue, however, seems to be with TSMC's manufacturing capabilities. Sources seem to indicate that TSMC could delay Navi to October if it cannot produce the required number of chips before July. However, AMD might still be able to get limited supply in shelves by July to counter the NVIDIA GTX 1660 Ti.